After four solid months of brilliant blue skies, harsh sunlight, and virtually no rain, we had overcast skies and some rain yesterday. It put us all in a silly stupor. Yesterday’s ride on a familiar route seemed brand new. It just looked so much different without the bright glare. This morning, I headed east. Normally, I’d be squinting my eyes and pouring with sweat. But today, the streets were wet, clouds swirled overhead, and it was in the low 60’s. I paused on a small rise, it was still a bit dark, but the clouds east of me had a faint glow. 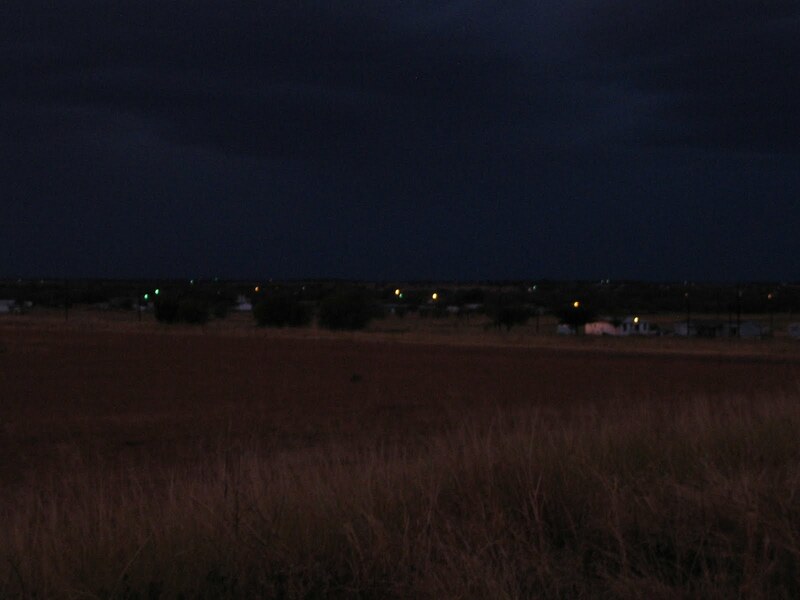 When I turned and looked southwest back toward my house, I saw the black sky. This was something we’ve not seen around here in more than four months. It was a different kind of dawn, and it was stirringly beautiful. This reminds me of our 2007 drought. I ride my bicycle everyday. That summer I forgot what it was like to ride in the rain and couldn't remember the last time I did. When it finally did rain, riding in it was so unfamiliar that it seemed strange I would forget how it feels. It was both different and exhilarating all at the same time. Good news you finally received some rain. Hey, did the bees survive the summer drought? Exhilarating is the word. For us, and the bees. Yes, the bees survived. They struggled near the end of the record heat. We gave up all hope for honey this year, and wondered if we'd need to start over next spring. But we still have a queen, and they are looking better since the heat eased up. As Mrs. Pondero says, "There's a lot of bees out there!" Wonderful. I truly love cloudy, overcast days. I like riding in the rain too, especially when it's a rare thing. When it seems like it rains every day, that gets old. But I never get tired of clouds. This morning, I discovered I WOULDN'T melt!